The global sterile medical packaging market is dominated by E.I. DuPont de Nemours and Company, BillerudKorsnas AB, and Amcor Limited, with Bemis Company Inc. also claiming a significant share in the market in 2016. Regional specialists such as the U.S.-centric Placon also play an important role in the global sterile medical packaging market. The key strategy for players in the global sterile medical packaging market has been mergers and other collaboration activities. Amcor Ltd. and Placon have both employed mergers and acquisitions to great effect. On the other hand, leading sterile medical packaging manufacturers such as DuPont de Nemours and Bemis Company have focused on capacity expansion as the key tactic to pursue. According to Transparency Market Research, the global sterile medical packaging market is expected to rise at a steady CAGR of 4.7% between 2016 and 2024. The market had an estimated value of US$26.5 bn at the end of 2016 and is expected to grow to US$38.3 bn by the end of 2024. The prime geographical segments of the global sterile medical packaging market are North America, Europe, Latin America, Asia Pacific, and the Middle East and Africa (MEA). 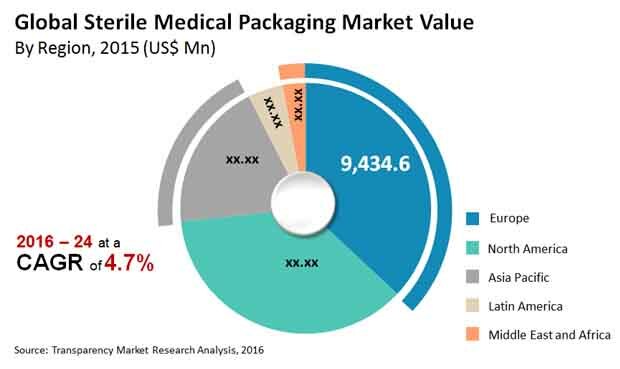 Of these, North America and Europe are likely to retain their traditional dominance in the global sterile medical packaging market, with both markets likely to be valued around US$13 bn by 2024. However, Asia Pacific and Latin America present promising expansion opportunities thanks to the steady rise in awareness about the importance of sterile medical packaging. By application, pharmaceuticals and biologics are likely to remain the key segment of the global sterile medical packaging market over the 2016-2024 forecast period. The segment accounted for 64.8% of the global sterile medical packaging market in 2016 and is expected to hold more than 66% by the end of 2024. The biologically active nature of many pharmaceuticals and biologics makes sterile medical packaging a necessity, and it is now being acknowledged as such in an increasing number of countries. The prime driver for the global sterile medical packaging market is the rising willingness of governments across the world to invest in healthcare in the attempt to provide advanced healthcare to the masses. Private investment in the healthcare sector has also risen rapidly over the last few decades, which has also helped the growth of the global sterile medical packaging market. The rising GDP of Asian and Latin American Countries has led to heavy investment in the healthcare sector in countries such as China, India, Brazil, Argentina, and South Korea in the past few years. This, along with the rising awareness about the importance of sterile packaging in the medical sector, is likely to remain a key driver for the sterile medical packaging market in the coming years. On the other hand, the difficulty in transporting and handling sterile medical packaging has remained a key restraint on the global sterile medical packaging market. These issues, however, are mostly application-specific and could be resolved in the coming years thanks to the rapid advances in the field of smart materials. The increasing preference for plastics instead of glass in sterile medical packaging could also be a key driver for the global sterile medical packaging industry in the coming years.